Katie Rain Hill was born Luke; but she always knew that she wasn't a boy. 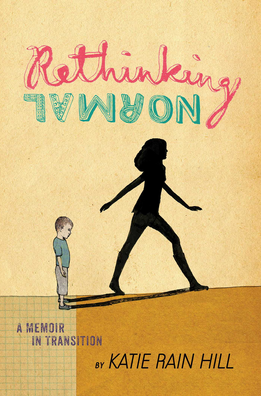 Rethinking Normal: A Memoir in Transition is her story. Though Katie was only twenty when she wrote this moving, honest book, she had already experienced a lifetime's worth of pain, self-loathing, confusion, cruel bullying, rage, pride and triumph. 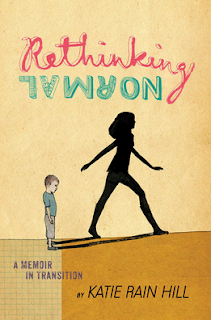 Growing up in the Bible Belt, Katie was always aware that something about her was 'wrong.' For a long time she categorised herself as gay, but she knew that wasn't quite right either. Suicidally unhappy, she eventually discovered, thanks to the internet, that there were others who felt the way she did, and that there was a name for it: transgender. Her bewildered but supportive mother helped her on her journey through transition, as did an anonymous donor who paid for her surgery. A surprising amount of this story concerns the tangle of dating and relationships -- just like most other adolescents, falling in love is an important part of Katie's life. I was slightly sad to read just how crucial it was to Katie that she should be pretty, not an ugly girl, and her relief when boys found her attractive. I guess I wanted to be a pretty girl, too, but on some level I accepted that it wasn't to be, and found my self-worth elsewhere. In the 80s, we used to argue that instead of trying to fit ourselves into boxes marked 'masculine' or 'feminine,' we should try to break the walls of the boxes down, and throw the labels away. Now it seems that finding the label that fits, even if that label says 'genderfluid,' is the most vital step in accepting oneself; meanwhile, the walls of those boxes seem to have become more rigid than ever. This seems to me a shame. But I respect the lived experience of Katie, Arin and those trans and gender-fluid kids that have entered my life. Power to you all!